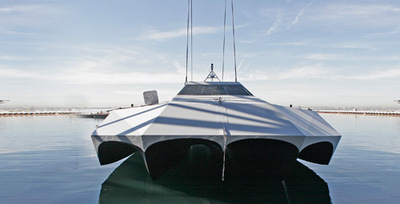 Motor yachts can broadly be divided into two categories - displacement yachts and planing yachts. Displacement yachts, like Archimedes in his bath, displace their weight in water and plod along, pushing the water aside in a big bow wave. Their top speed is proportional to the square root of the waterline length, and even if you crank up the engines, the yacht will not go any faster. Only if you massively increase the power (and ideally tinker about with the hull lines a bit) will the yacht rise out of its hole in the water, develop hydrodynamic lift, and start skimming over the water. There are downsides of course - the fuel consumption increases enormously, and the movement of the yacht is a lot less comfortable, particularly in a heavy sea. But now some clever boffins have come up with a third option - the really cool looking M-Ship .